Posted November 28, 2018 by Andrea Laford & filed under Headlines, News. In an interview with In Touch host Peter White on Radio 4, eighteen-year-old blind actress Ellie Wallwork revealed she was tapped to perform some mild stunt work in her role as Hanne in the ninth episode of Doctor Who Series 11, It Takes You Away. Actually I had a stunt double, which is really hilarious to say. Sadly, [she was] not [blind]. Yeah, I did a couple of stunts but not anything too serious ‘cause I wouldn’t have been able to do it, I don’t think. Wallwork praised the Doctor Who cast and crew for making her feel welcome. It was amazing. I always felt like I belonged. I always felt included. They made a lot of effort to make me feel at home, really. They always helped me in terms of like guiding me around the set. And we always blocked out scenes beforehand. And filming with the cast was fantastic. They’re all so funny and I got on with them so well and I really, really felt happy there. Her father is a big Doctor Who fan. [My dad is a] massive fan. He loves it. The first time, when I told him I was going for an audition, we were actually in the car and he came back from getting some petrol or something and he didn’t speak for about five minutes because he was so shocked! He was like, “What?” ‘Cause it’s his childhood show really. He loves it. There are definitely a couple of scary monsters, but not only is it physically scary, it’s psychologically gripping ‒ there are quite a few themes that you wouldn’t think would be tackled in this type of episode. It will surprise people. The Doctor finds [Hanne] abandoned in a cottage. Her dad has left her alone for a few days, but he’s been gone longer than expected. There’s a monster in the woods that howls at night, which terrifies her because she thinks it’s taken her dad away. 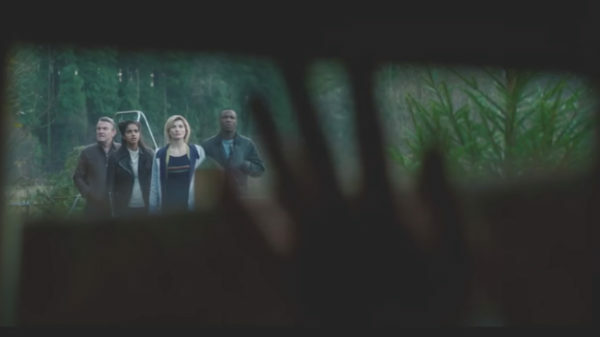 The Doctor and her friends want to help her get him back but they soon realize the forces in the woods are far darker than they ever could have imagined. In her Radio 4 interview, Wallwork says she had no expectations going into the job. I don’t really know what expectations I had. I mean it’s Doctor Who! What can you think would happen? People have been approaching me and have been, “Oh, is it true you are in Doctor Who?” and I haven’t really known how to react. I’m not really a megastar but lots of people have wondered why I didn’t say a lot but I couldn’t because if it had gotten out then it would have been great and I needed to keep it a secret and it was so difficult! Wallwork, studies at The Royal National College for Blind and is optimistic about her prospects. I’d definitely like to pursue acting in the future. You can find out more about It Takes You Away here, here, and here. It Takes You Away airs on Sunday, December 2 at 6:30 p.m. on BBC One and 8:00 p.m. on BBC America.